← How does a knitter begin? False starts and true beginnings. In April, I’ve been taking part in the Love Your Blog Challenge, hosted by A Playful Day, which has seen me taking a weekly theme as the prompt for a blog post. I’m really enjoying taking part, and particularly reading all other participants’ posts. It’s been a great way to discover many interesting blogs and voices. This week’s prompt for the Love Your Blog Challenge has, for me, been more “challenge” and a bit less “love your blog”! The topic to explore was “Ugly”, and I have to admit that I’ve really struggled with it. When I saw what the topic was, I felt almost immediate strong resistance, without really knowing why. 2. hostile or threatening; likely to involve unpleasantness. 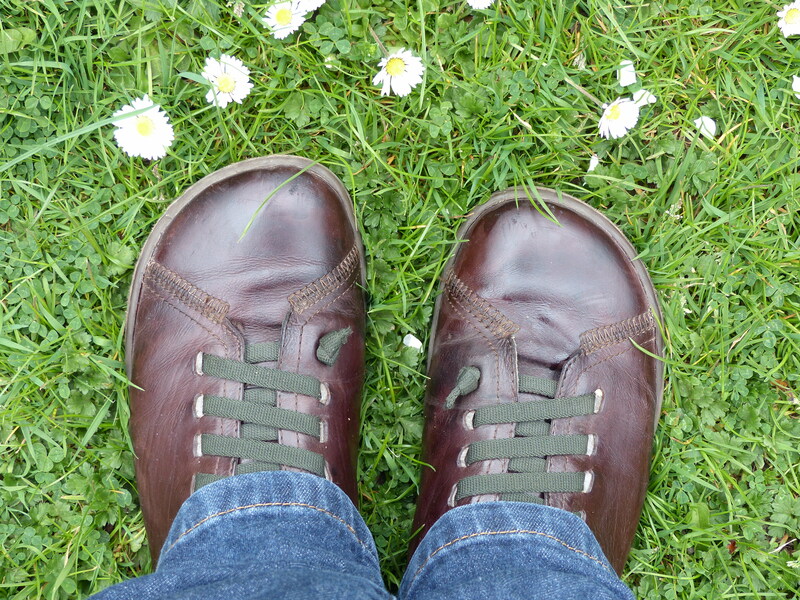 They are well-worn and well-loved shoes of mine, which I’ve had for years. A friend described them as “ugly in a good way”! I admit that they are in a very scruffy state now, but I love their utilitarian, snub-nosed plainness. (They are also incredibly comfortable.) You may love them or hate them and I suppose some people might consider them ugly. The daisies at my toes may also be seen as undesirable weeds which must be eliminated from any lawn. Ugly maybe to some? Yet to other people, these same daisies enhance a lawn, and represent individual jewels waiting to be made into stunning necklaces, or the crown of a great queen. Having spent a week thinking about “ugly”, I’ve come to the conclusion that I don’t really believe in it (in the sense of the first limb of the definition). It’s incredibly subjective, but because it’s also a very harsh criticism, it can have a powerful impact. While beauty might be said to be just as subjective as ugliness, the label “beautiful” implies worth and is likely to make us look more closely, whereas the label “ugly” implies the opposite. It’s likely to make us look the other way. Beauty and perfection are becoming the norm in so many of the images and objects we are presented with. There is a risk that our perception of ugliness is also shifting to mean anything which does not meet these “norms”. Judging a book by its cover and finding it “ugly” means that we may not take the opportunity to look any further. Even on a simple and harmless level, we may miss out on delicious misshapen vegetables at a farmer’s market or fail to see the inspiration hiding within the myriad colours and textures of the cracked tarmac pavement beneath our feet. (KNITSONIK has woken many knitters from their slumber of not seeing the beauty of tarmac. Read her blog post about Tarmac Tuesday here.) I’ve come to the conclusion that for me, “ugly” is a set of blinkers, to be treated with extreme caution. I don’t think I would have written this post, had it not been for the Love Your Blog Challenge. I’ve felt very stuck at times while writing it, and although I’m not altogether sure that I got unstuck in the end, it’s been an interesting experience. Thank you for the challenge! This entry was posted in Uncategorized and tagged #aninspired2015, #loveyourblog, A Playful Day, KNITSONIK, stuck, Tarmac Tuesday, ugly. Bookmark the permalink. Ugly is definitely subjective, and it’s really a lazy way to describe something. There’s probably always a better adjective than a blanket pronouncement like ugly. I love this post – like you, I’m finding the prompt really difficult because “ugly” is not a word I tend to use – it comes loaded with far too much negative judgement for me to be comfortable with it. And my blogging is all about trying to find the beauty in life. Also, I really like those shoes. The shoes I tend to find ugly are the sparkly ones with skyscraper heels that the fashion magazines say I should think are beautiful! I actually LOVE the way you’ve laced up those shoes! 🙂 Yep, definitely can seek beauty out in most places. And I’m with Wendy in saying “ugly” is a lazy adjective, almost as lazy as “nice”. I went to some of the same places when mulling over this week’s topic. It’s been interesting to see all the different interpretations this week.